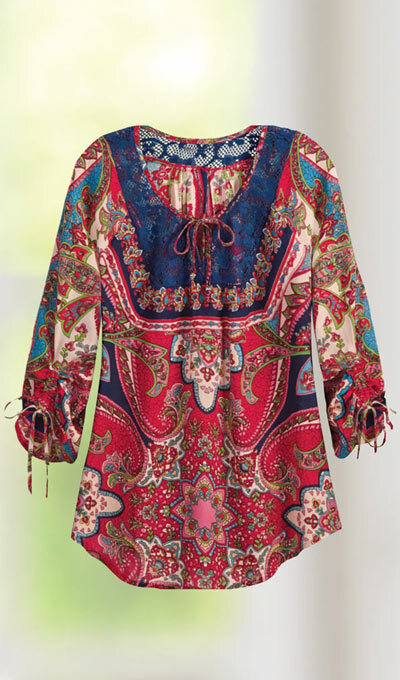 There's so much to love about our Boho Chic Paisley Top! Paisley print, soft, flowing, rayon gauze and crocheted lace yoke. Easy pullover style and scoop neckline with keyhole tie, three-quarter raglan sleeves with drawstring cuffs, soft gathers front and back, rounded shirttail hem. Machine wash. Imported. Misses, approx. 28"l.